Get 8 DeliciousBone Broth Recipes! 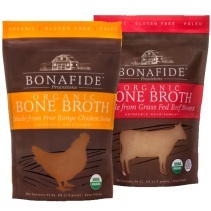 Get 8 DeliciousFree Bone Broth Recipes! Join our e-mail list and get this free recipe guide. /g, ""); //htmlcontent = htmlcontent.replace(/<\/ul>/g, ""); htmlcontent = "
" + htmlcontent + "
These pre-soaked healthy cereals from our friends at JoshEWEa’s Garden contain only organic or all-natural ingredients. They are prepared using traditional methods to maximize nutrition and digestibility. Soaking the organic oats in an acidic medium and the organic nuts in salt water for an extended time transforms many of their key properties, making them much easier on your tummy. Each of our soaked granola cereals can be eaten right out of the bag, tossed into your yogurt, or covered with milk. For even easier digestion, the cereals can be cooked up quickly on your stove. Just cover with some hot water and simmer until the creaminess is to your liking. Watch out – the aroma can be intoxicating! Beyond the science of superior nutrition, the taste of these traditional foods will amaze and delight you. Available in seven delicious flavors.